The Cornerstone Biblical Commentary series provides students, pastors, and laypeople with up-to-date, accessible evangelical scholarship on the Old and New Testaments. Presenting the message of each passage, as well as an overview of other issues relevant to the text, each volume equips pastors and Christian leaders with exegetical and theological knowledge so they can better understand and apply God's Word. 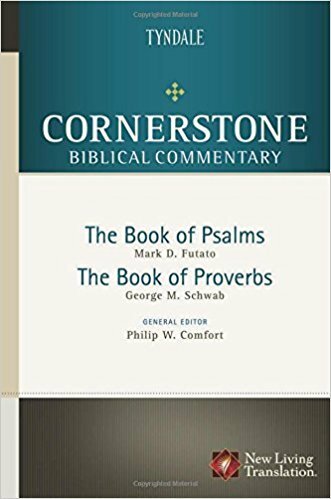 This volume includes the entire NLT text of Psalms and Proverbs. Other features: Provides pastors, teachers, and students with up-to-date evangelical scholarship. Both exegetical and translation commentary. Part of an 18-volume collection. Features New Living Translation Text. Mark D. Futato, Ph.D., The Catholic University of America, is Robert L. Maclellan Professor of Old Testament and academic dean at Reformed Theological Seminary in Florida. He is the author of several books and articles, including Beginning Biblical Hebrew and Interpreting the Psalms: An Exegetical Handbook. He has also contributed to The Spirit of the Reformation Study Bible and The New International Dictionary of Old Testament Theology and Exegesis. Dr. Futato is an ordained minister and served on the translation team for the book of Psalms in the New Living Translation. George M. Schwabb, Sr., Ph.D., Westminster Theological Seminary, is associate professor of Old Testament at Erskine Theological Seminary in South Carolina. He is ordained in the Second Presbytery of the Associate Reformed Presbyterian Church and is a member of the Society of Biblical Literature and the Evangelical Theological Society. He has authored numerous scholarly publications, including Hope in the Midst of a Hostile World: The Gospel According to Daniel. He served as a reviewer for Psalms and the wisdom books for the New Century Version.